May Queens featured in Tudor and Stuart celebrations, though the Queen was usually one of a royal couple – the Lord and Lady of the May. The Victorians tended to filter out the male presence and focused on the Queen. May Kings did survive, however, in many village customs. 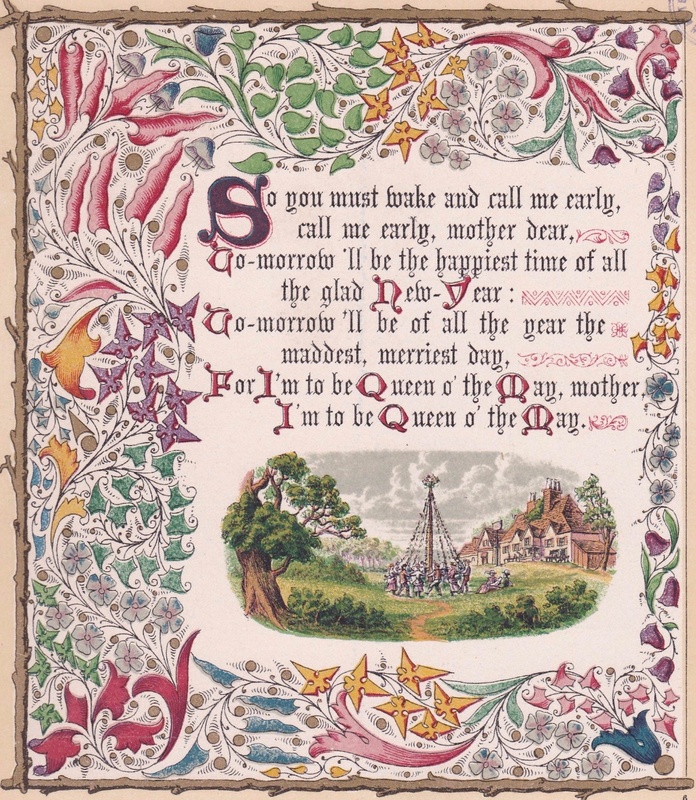 The poet Alfred Tennyson did much to popularise the tradition with his long poem The May Queen (1855). The work is a meditation on beauty, vanity and wasted youth and was hugely popular in Victorian times. It was set to music by William R Dempster. Tennyson once visited Dickens at Lausanne and found the novelist's daughter Mamie singing his May Queen at the piano. For I’m to be Queen of the May, mother, I’m to be Queen of the May! The crowning of May Queens was ritualised by John Ruskin at Whitelands College in 1881 (see Maypoles above). 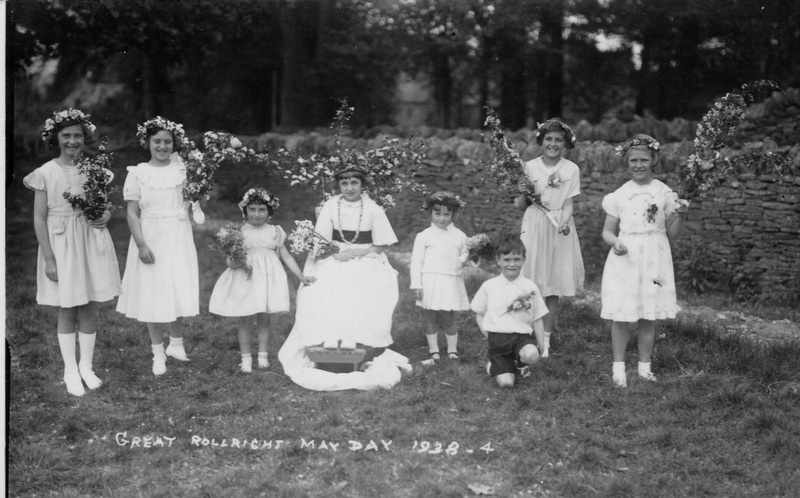 The May Queen we have inherited from his vision is a girl who presides at May Day celebrations, often with a retinue of attendants. She wears a white gown and a crown or garland, and typically returns the next year to crown the new May Queen. 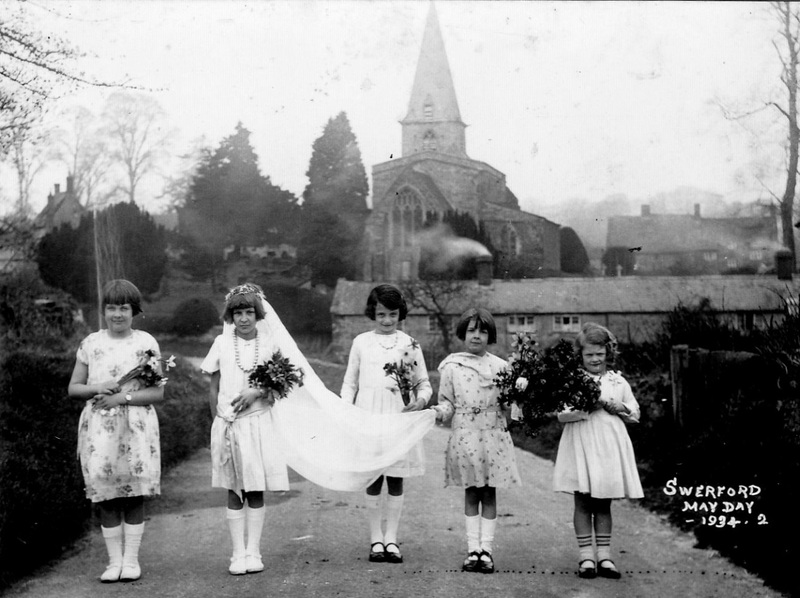 May Queen at Great Rollright, 1938.. A resident recalls how after maypole dancing on the village green, all the children toured Great Rollright on a farm cart carrying garlands of flowers. 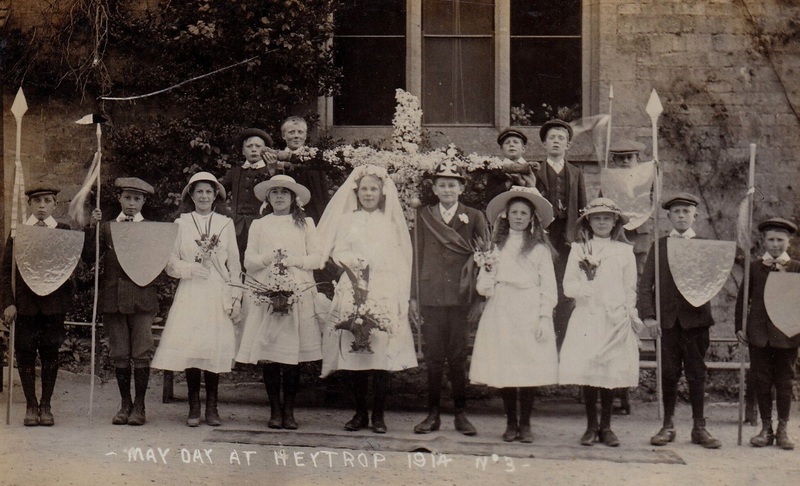 A May King and Queen at Heythrop, 1914. Note the cruciform garland and the four armed attendants - this was the eve of the Great War. 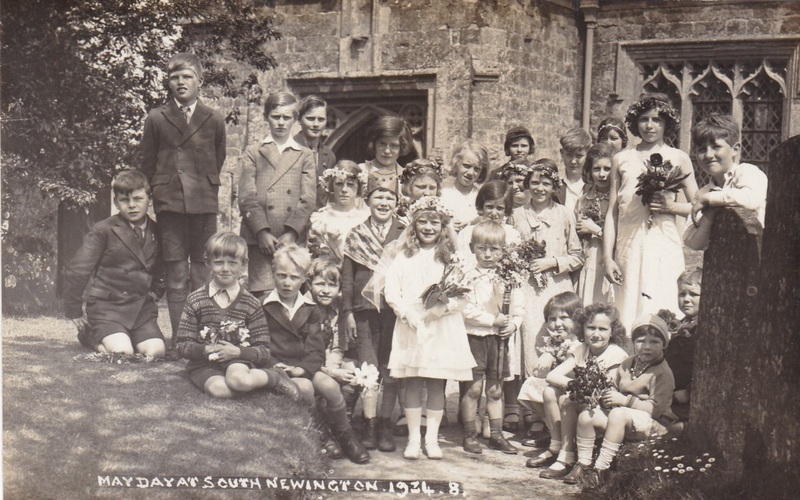 May King and Queen at South Newington, 1934. As at Heythrop above, headgear and sash appear to be the King's main items of regalia. The month of May is consecrated by the Catholic Church to the Virgin Mary as ‘Queen of May’. Pilgrimages and visits are made to churches dedicated to the Blessed Virgin. A ‘May Crowning’ of statues of Mary with garlands, and a rosary procession are other features of the tradition. The customs spread from the 17th century, and must have compounded Puritan hostility to May Queens who were now associated not only with the pagan Flora, but with the Papacy. 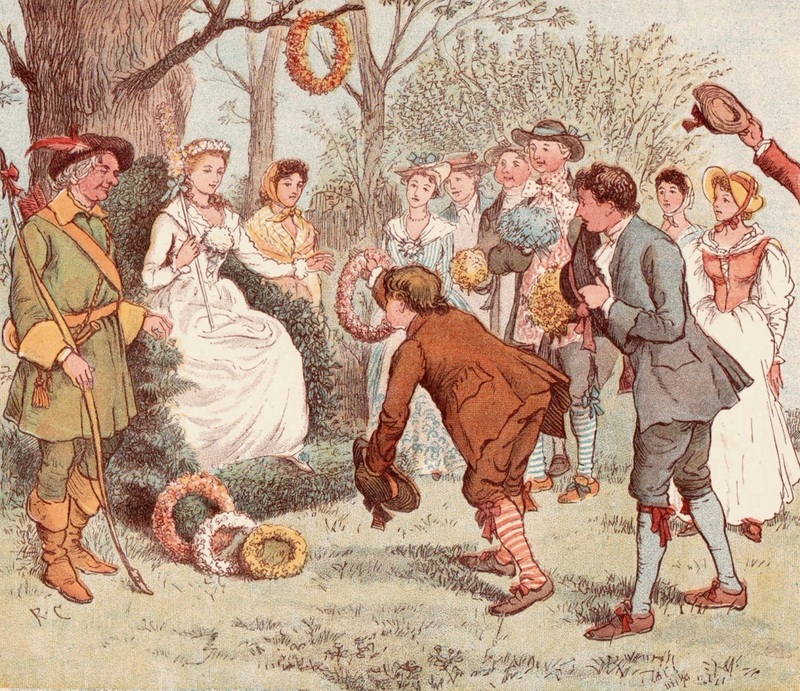 There was a village tradition of 'lifting' whereby a group of young men would lift a pretty girl in a flower-bedecked chair on May Day. 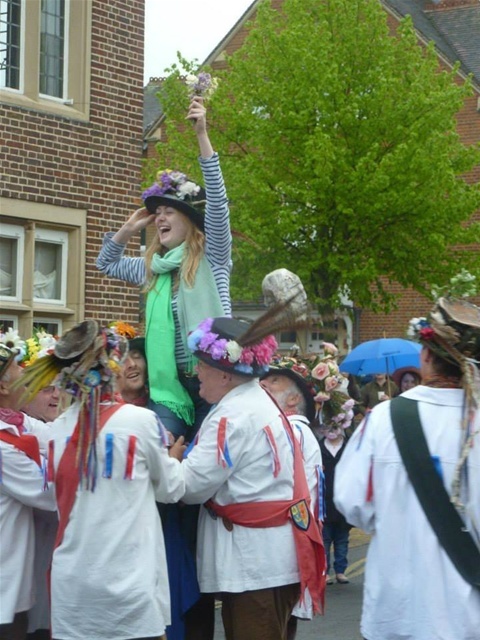 A vigorous variant on the May Queen custom, the practice survives among morris dancers in Oxford. It's all rather impromptu (flower-bedecked chairs inessential).